As heavy rain continued to bring flood waters to Rio de Janeiro in Brazil, the death toll also rose to almost 600 people. People have been searching for their family and friends who were washed away by the heavy flood and mudslides. The worst affected were the mountainous areas of Nova Friburgo and Teresopolis, which are nearby cities of Rio. Thousands of people lost their homes and sheltered in evacuation centres. On the other hand, the schools and even police stations became temporary morgues due to the increasing number of dead bodies. The never-ceasing rain and large amount of mud have been hampering the recovery and relief operations, resulting to shortages in food, water and medical supplies to some areas. The natural disaster was described by residents as tsunami from the sky as reddish mudflow struck those families who were still fast asleep. 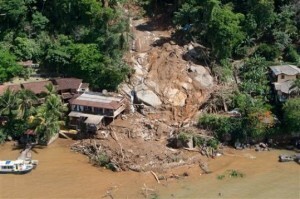 The landslides buried their homes and covered them with mud, while the floodwater submerged the city. The affected region was once a tourist destination but now, it’s a disaster area. This is one of the worst tragedies in the history of Brazil. And with the weather forecasters giving warnings for more heavy rains to come, the fear for more damages to lives and properties are yet to come.